GameSHOUT reviewed Logitech G7 Laser Cordless Mouse, a wireless full-speed USB mouse based on 2000 dpi ultra-high resolution laser engine technology, rechargeable battery, battery level indicator and scroll wheel. GameSHOUT gives Logitech G7 Laser Cordless Mouse rating of 9.5 out of possible 10 and concludes that “This GameSHOUT reviewer gives the Logitech G7 Cordless Gaming Mouse a hearty two-thumbs up; it is worth it to have such a responsive cordless mouse dedicated to gaming. 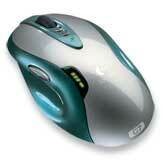 I believe that this mouse really WAS built by gamers for gamers”. The Good: Design, resolution plus resolution adjustment, dual battery packs, incredible response and very little outside interference. The Bad: I did run into some interference with a wireless computer that was within 3′ of the sending unit, and from a short-wave radio.